If there is one appliance in your kitchen that operates twenty-four hours a day, seven days a week, three hundred sixty-five days a year, it’s your refrigerator. Today, nearly all refrigerators and freezers are packaged and ready to use. 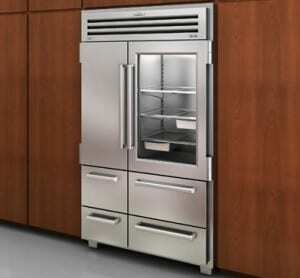 If you want to know how your fridge operates, you will first need to know the essential parts of the appliance itself. Understanding the basic components of a refrigerator and how it operates will help you identify future refrigerator repair issues, should they arise. Compressor: The compressor is responsible for compressing the refrigerant in order to achieve a certain temperature and raise the refrigerant’s pressure. Refrigerant: As the temperature cools, the refrigerant condenses to liquid so that it may easily flow through the expansion valve. The refrigerant then moves from a high pressure zone to a low pressure zone, causing the liquid to expand and eventually evaporate. Heat is absorbed during this process of evaporation, therefore, cold temperatures are produced as a result. This cycle is repeated on a continuing basis. Expansion Valve/Evaporator: The expansion valve or evaporator is used to not only evaporate the heat from the refrigerator, it is also used to absorb the heat from the fridge. Heat Exchanging Pipes: The heating exchange pipes are located on the exterior of the unit and helps the refrigerant to dissipate the heat of the pressure. So, how does a refrigerator actually work? The process begins with the compressor, in which it compresses the refrigerant in order to raise its pressure and temperature. Then, the heat exchange pipes allow the refrigerant to disperse the heat of the pressure. While the temperature cools, the refrigerant is condensed to liquid so that it can flow through the expansion valve. Then, the refrigerant moves from high pressure to low pressure, causing the liquid to expand and evaporate. While the liquid is evaporating, heat is absorbed and cool temperatures are produced. This cycle continues over and over again in order to keep the items in your fridge cool without breaking down. If your fridge does break down, contact C&W Appliance Service to schedule an appointment with one of our refrigerator repair technicians. We proudly serve the Dallas, Fort Worth and San Antonio area.